Judging from the vast literature on dysfunctional nonprofit boards and organizations (my own posts included!) one might conclude that the majority of nonprofits are struggling, incompetent and/or in crisis. I argue that this is not the case. Decades of experience lead me to believe that nonprofits have the same functional variables as profit making organizations—dysfunctional at times like Target or GM; efficient like Apple or Whole Foods; adaptable like Del Monte and Cisco. Everybody doesn’t get it right all the time. Perceptions become reality to those who are quick to embrace popular labels such as the overused term, “dysfunctional.” Obviously, in the case of nonprofits, such perceptions are harmful. Once evaluated in this way the stigma persists and can seriously reduce the level of support that is so critical to the work of these organizations. What characteristics color these perceptions? •	Small Organizations: About one-third of the charitable nonprofits have gross receipts under $25,000 a year. At that level the vast majority can’t employ more than one full-time person, overworking those with job responsibilities that can’t be delegated. While small organization can’t do much to improve the misperceptions about nonprofit dysfunctions, more mature ones can take deliberate steps over time. •	The Volunteer Challenge: A large cadre of board and operational volunteers take time to assist struggling charities, which give the organizations appearances of nonprofit always being on the edge or existence. Many outsiders are unaware that those on management and staff are highly competent people who accept this employment condition because they know how their work can positively impact the lives of clients. •	Facilities: Nonprofit facilities are often second rate and appear highly dysfunctional. Client needs, not facilities, are primary to the board, management and staff. •	Stakeholders: They often do not appreciate the tremendous impacts that the staff can have. Example: Donors often don’t have contact with those who directly benefit. •	Board Dysfunctions: A root cause of the perception may be due to a dysfunctional board trying to resolve internal conflicts, and there is little the management and staff can do about it. Valiant managements and staffs can sometimes achieve productive impacts without board support. Competency & Relationships: I have encountered many CEOs who have more management expertise than many of their board members who are professors, accountants or physician, etc. While I appreciated that dealing with volunteer directors may involve working with some persons with outsized egos, the CEO must strive to portray himself as a competent manager. The positive outcome is that the CEO is viewed as a peer working with the board, not under the board. Many staff persons figuratively stand ten feet tall for what they accomplish on behalf of clients.. The CEO has an obligation to make sure that the stories about outstanding staff personnel are well acknowledged, so that stakeholders know about them. This takes more then simple public relations events. It involves highlighting and rewarding those who are highly productive. Facilities: I understand the tradeoff between expenditures for facilities versus expenditures for clients. Having first class facilities may even hinder achieving a mission if donors perceive their donations are being used for plush facilities. At the least, the nonprofit needs to have an uncluttered area for board meetings and events with outside stakeholders. Implications: Many suggest that a nonprofit organization being perceived as dysfunctional is not an important issue, as long as mission objectives and impacts are achieved. I argue that more resources for clients could be developed if the perception is not a diminished one. Some can equate dysfunction with being inefficient. In addition, a positive perception might make it easier to attract more qualified board members, management and staff. ← Can Nonprofit Boards Afford To Underinvest In Management Leadership Development? Eugene, your posts are all excellent. All. Really. On this one, I too have had decades (four) of nonprofit experience. My takeaway is different than yours on the point you are making today. 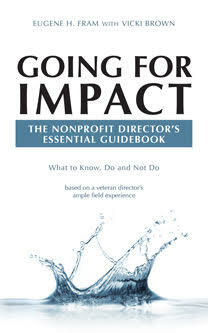 “…one might conclude that the majority of nonprofits are struggling, incompetent and/or in crisis. I argue that this is not the case.” My experience tells me this is in fact the case. It may not be helpful, as you indicate, to make this sweeping conclusion and continually use the word “dysfunction.” My belief is that dealing with this as a reality may be the best way to awaken the “ground hog day” of nonprofits not being prepared to be nonprofits. I am on the side of acknowledging this as a reality and taking a hard-line approach to trying to resolve it. Much like we need to take a hard-line approach to the absolute reality of congressional dysfunction. Maybe not at the Peter Finch level, but something akin to it. Otherwise we are part of the ongoing problem. For my part, I am nearing completion of a book about this very thing. I agree that they’re no more or less dysfunctional that for-profit entities. That said, however, I have served as staff to large public and nonprofit boards my entire professional career and my experience is that they’re mostly mediocre. They run into challenges such as: no one has ever explained what their jobs are; that they’re supposed to personally give to the nonprofit; they don’t know how to read financials. They’re well-meaning people who want to do good but don’t know how. And these types of boards are “run” by the Executive Director. It shouldn’t be that way. At the very best, the Executive Director should be a partner with the Board but policy needs to come from the Board, using the Executive Director as an esteemed resource. I currently work for a 21-member board of directors. They are, hands down, the best board I have ever seen. Here’s what makes them special: They are completely dedicated to the area we serve; They each give financially as well as of their time and talent; there are no political (small p) factions; they thoroughly admire and respect each other. I am in awe of them. Jane; Thanks for adding to the discussion. You also may be interested in these articles and links, especially the blog-site and book, if you haven’t already seen them. The nonprofit governance model in the book is based on: building trust between the board and management, eliminating redundant board committees; eliminating board micromanagement; focusing the board on policy & strategy and having a robust board evaluation focused on outcomes and impacts, not processes. It has been adopted or adopted by thousands of nonprofit boards. Many ways book can be used: Adopt or adapt the model; Reference source for board issues; Training tool board development; Motivational tool for director engagement; Reference to understand board governance & compliance obligations. A leader’s guide is available for the book for those who want to use it as a base for collegiate/ continuing education classes or for short seminars that appeal to board members and CEOs. BTW: My partner on the book is a professional writer. The material in the book is however, is based on my extensive field experiences as a NFP board director and consultant. All examples reported have a fact base without embellishment. The material is presented in story line format for interesting and easy reading.